Cable companies may hate TiVo, but at least they've come to accept that digital-video recorders are here to stay. Or have they? Time Warner Cable is introducing a DVR-like service called Look Back that lets viewers time-shift shows but doesn't let them fast-forward through the ads. (Time Warner Cable is a sister company of my employer, Time Inc.). From a viewing-experience point of view, Look Back is a step backwards compared to a full-throttled DVR like TiVo. You can only watch shows from earlier the same day and you are forced to watch the ads. The whole point of DVRs is that they allow you to watch shows when you want to watch them, which might include catching up on a whole week's worth of The Daily Show at 3 AM on a Saturday. Being limited to one day's worth of TV sort of defeats the purpose. And don't underestimate the appeal of being able to skip through the ads. It makes the TV-viewing experience both more enjoyable and more efficient (you can watch more actual TV when you strip out the ads). So what are the folks at Time Warner Cable smoking? They are betting that people will put up with their hobbled, networked version of a DVR because it will be free. (TiVo, in contrast, charges an extra $13 to $17 a month for its service). It's amazing what people will put up with if they think they are getting something for free. But this is a stop-gap measure at best. If the cable companies really want to counter the threat of TiVo, they are going to have to come up with a service that is better than TiVo. Not one that is worse, but free. The thing about Bug is that it's not anything like the iPhone. It's closer to Ning. It's all about what people will make with a Bug, not what a Bug is when it comes out of the box. 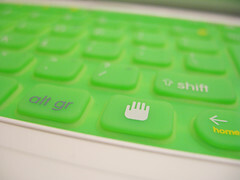 The buzz around open-source hardware is just going to keep getting louder because it is an idea whose time has come. Bringing the culture of participation to physical products is a natural evolution of the open-source, DIY world we are now living in. What open-source hardware/products would make the most sense to build a business around? Comments are open. We smell a lot of retail participation in this process. That is code for the average investor, suckers like you and me who have been watching too many iPhone ads on TV as opposed to the Wall Street pros who supposedly look at the market dispassionately through the cold logic of their spreadsheets. 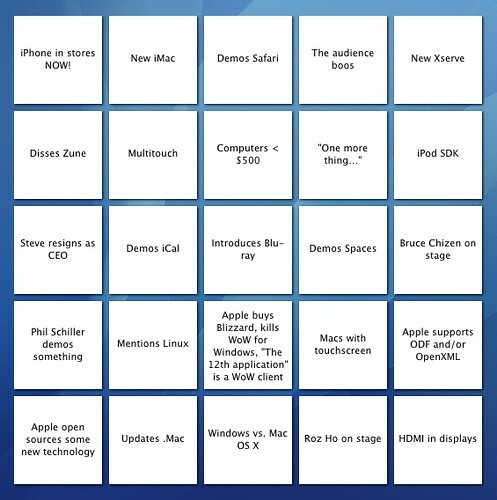 Keynote Bingo - WWDC 2007, originally uploaded by jflint. Any of the first three would be a big deal. I guess we'll just have to wait a few hours to find out what he actually decides to announce. But, in the meantime, you can play Keynote Bingo. Update: And the winner is . . . opening up the iPhone to outside developers. The development platform for the iPhone will be the same as Apple's Safari Web browser, which is now also available for Windows. A lack of third-party software widgets for the iPhone was previously one of its major drawbacks. Don't expect too many non-Apple iPhone widgets by June 29, but now it shouldn't take too long for the menu of options to fill up. Jobs spent most of his speech talking about Leopoard (one cool new feature is called Stacks, and it lets you organize all the icons normally cluttering your desktop into a launchable stack from your dock). No mention of a Google-Apple Webtop combo or iTunes movie rentals. No new hardware. Can Private Equity Save Palm? Private equity firm Elevation Partners agreed to buy a 25 percent stake in Palm (PALM), the struggling handheld computer company behind the Treo. The price: $325 million. Palm was earlier rumored to be looking for a buyer for the whole company, but apparently could not find any takers. Elevation Partners' Roger McNamee and Fred Anderson will join Palm's board. As will Jon Rubinstein. Both Anderson and Rubinstein are former Apple executives—Rubinstein ran hardware and introduced the iPod under Steve Jobs; Anderson was CFO, until he left amidst the stock options scandal. How Elevation hopes to turn around Palm is unclear, especially when it will soon be facing competition from Apple itself when the iPhone hits stores at the end of June. Palm's announcement just last week of a new Treo companion ultramobile laptop called the Foleo garnered a ho-hum response. It's going to have to do better than that, and fast. 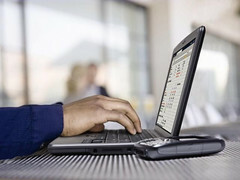 Microsoft unveiled a new tabletop computing interface it is dubbing "surface computing." In the works for five years in Microsoft Research as a project called Milan, the idea is to transform a surface as big as tabletop into a touchscreen in order to be able to manipulate images, paint with brushes, or move digital objects around with your fingers. (Check out the Popular Mechanics video embedded above). Microsoft did not invent this concept. I've seen it before in high-end custom-hardware mapping applications, and Apple's upcoming iPhone shares some of the "multi-touch" interface techniques (such as being able to make a picture bigger by pulling apart opposite corners with two fingers). But this may signal that the technology is finally ready to leave the research labs and venture into the real world. Still, I wonder if this technology is getting ahead of itself, or are we truly on our way to a more immersive, Minority Report-like era of computing? We are still many years from this going mainstream. These Microsoft Surface computers will cost $10,000 to start, and are being sold to enterprises such as T-Mobile and Starwood to liven up their retail stores and hotels. I still want one though. The One Laptop Per Child non-profit headed up by MIT's Nicholas Negroponte is coming up against its self-imposed deadline of May 31 to secure three million orders for its little green computers. Lots of developing countries have shown interest, but none have yet signed on the dotted line. In a 60 Minutes segment, Negroponte accuses Intel of trying to scuttle One Laptop Per Child's chances of success by pushing its own $400 Classmate laptop to the same education ministries around the globe. Even at $176 per laptop, government officials in places like Brazil or Cambodia are understandably wary of spending scarce funds on an unproven technology. Maybe Negroponte should pound the drum harder not just on the affordability of his laptops, but on how they are also much more environmentally friendly than the alternatives. One Laptop Per Child's chief technology officer Mary Lou Jepsen attended a Disruptors roundtable I held three weeks ago at MIT, where she pulled out a $5 flexible solar panel her team had designed to help power up the laptops. The day before I had visited her at One Laptop's offices, where she took me through many of the features of the computer. If every computer on the planet were replaced with one of these, she calculates it would save at least $11 $8.5 billion in electricity costs alone. These little laptops are so energy efficient that they are designed to run for 8 to 10 hours on a single charge. They can do that in part because they are so stripped down—with no hard drives and screens that can use the sun as their light source—and in part because the computer shuts down anything that is not being used at that moment. So there is no idling, which drains the battery. In addition to the solar panel, Jepsen's team is also exploring other accessories for charging the laptops off the grid in a pinch, including hand cranks, foot pedals, car-battery chargers, and a pull-string device that looks like a giant yo-yo. (Sadly, I accidentally broke one of the yo-yo prototypes by yanking it too hard. Yes, I do feel like a total jerk who is now depriving some kids in Cambodia of a way to keep their laptops running. But, in my defense, that string was pretty flimsy). Take that Intel (and Apple, for that matter). —seemed open to the possibility of distributing the current Tiger OS cheaply to the developing world once he begins selling Leopard in the developed world.